*Offer available while supplies last. Limit one (1) Gift Card per email address, mobile phone number or household address. Use products only as directed. © Johnson & Johnson Consumer Inc. 2019. 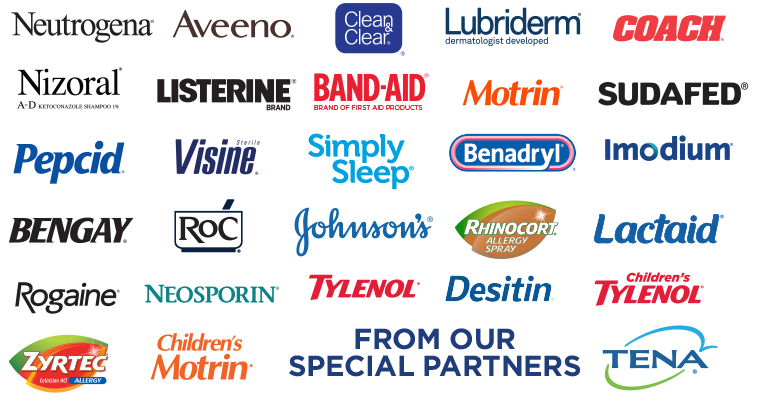 NEOSPORIN®, BAND-AID® Brand of First Aid Products, COACH®, BENADRYL® Topical, BENGAY®, NEUTROGENA®, AVEENO®, CLEAN & CLEAR®, RoC®, LUBRIDERM®, DESITIN®, JOHNSON’S®, LISTERINE®, VISINE®, ROGAINE® and NIZORAL® are brands marketed by Johnson & Johnson Consumer Inc. TYLENOL®, CHILDREN'S TYLENOL®, SIMPLY SLEEP®, PEPCID®, IMODIUM®, MOTRIN®, CHILDREN'S MOTRIN®, BENADRYL®, ZYRTEC®, RHINOCORT® and SUDAFED® are brands marketed by Johnson & Johnson Consumer Inc., McNeil Consumer Healthcare Division. LACTAID® is a brand marketed by McNeil Nutritionals, LLC. BAND-AID® is a registered trademark of Johnson & Johnson. RHINOCORT® is a licensed trademark of AstraZeneca AB. TENA® is a brand of Essity, a special partner of the Johnson & Johnson Family of Consumer Companies. TENA® is a registered trademark of Essity Hygiene and Health AB.